Do you think your neighbors might be vampires? Or do you just get the feeling that there are a lot of vamps hanging out near your home? If you do, and you’re not the “come bit my neck” type, you might want to do a few things to safeguard your home against vampires. So you can sleep soundly knowing that you have vampire-proofed your home! Here are a few things to get you started. Start by hanging cloves of garlic in all of the entryways to your home. Garlic is known for keeping vampires at bay and so, this is an old classic to try. 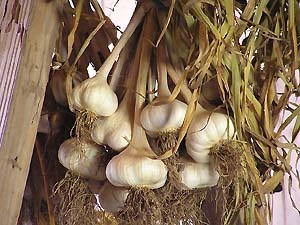 Also, be sure to take note of anyone that seems adverse to all the garlic – they could be a vampire waiting to strike! And if Â you want to be extra cautious and keep your pets safe as well (especially if they venture outside of the home), you might want to rub them down with a clove of garlic as well. Crucifixes are also key when trying to protect your home against vampires. Vampires hate the sight of the crucifix and so, putting as many of them out as possible is a must. Hang each crucifix over every bedroom door in the house, and try to have at least one in every room. Again, you can up the ante with this type of protection by wearing a crucifix around your neck and making sure that your other family members do too! Iron is another thing that vampires are especially adverse to. Hanging up iron nails or even keeping an iron pan on your stove will certainly deter any vampire that thinks about coming into your home. One thing that might not be so commonly-known is that vampires are obsessive compulsive. This can help you protect your home from vampires by scattering seeds onto your lawn. No vampire will be able to pass it by without stopping to count them and by the time they’re finished, they will have either lost interest in you or they’ll be forced back to their lair by the sunshine. Lastly, be sure to never ever invite someone you think might be a vampire into your house. Even if they leave everyone in tact, any vampire that’s been in the home before becomes impervious to anything that you have done to deter vampires from your home. Then, they will be able to come back any time they choose! This is so not true. I am a vampier and i know it. if you are gowing to do this. talk about the right things. These are the right things. All of these methods came from age-old folklore from multiple countries. People long ago actually did these things and in some places they still do. Moonlight is right. You wannabe-vampires just do not know the folklore! Human who LOVES vampire folklore! Yes this is correct. Vampires are demons and hate goodness. Garlic kills anything. It’s gotta repel vampires. Actually, garlic has been associated with purity since Ancient Egypt, which is the real reason it repels vampires. The same applies to roses, which also can be used to repel most supernatural forms of evil.